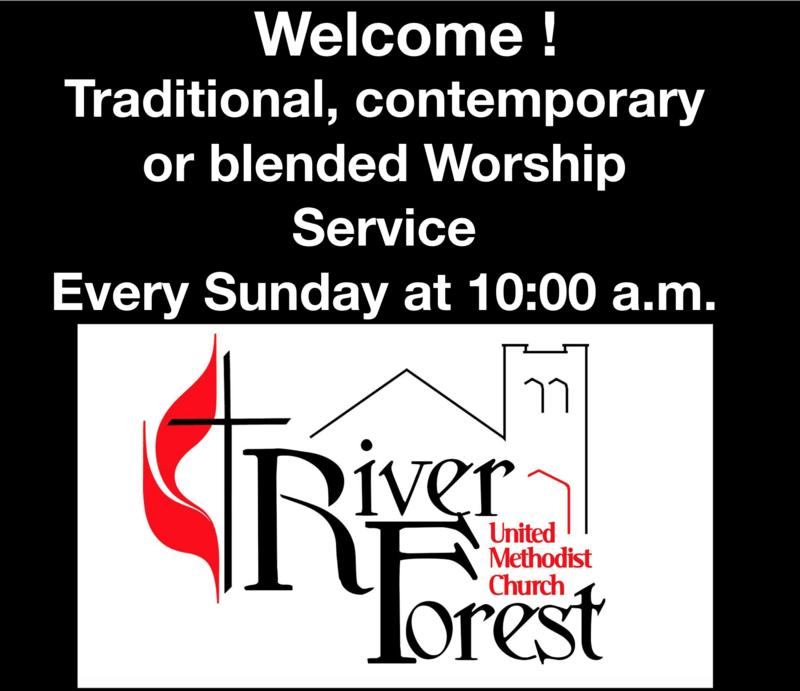 River Forest United Methodist Church is the result of the merger of five congregations over the past 129 years….River Forest, Austin, Maywood, Forest Park, and Melrose Park. The names, locations, and structures change, but the spirit remains the same. Read more about our proud history . . . In 1860 Frances Willard and Clara Thatcher started a mission Sabbath School in the Little Red Schoolhouse on Lake Street. In 1869, with the support of the Thatcher and the Odell families, a Methodist Society developed. A preacher was appointed in 1870 to establish congregations in the villages of Oak Park, Austin and Thatcher (now River Forest). Incorporated on February 14, 1871, the first church building was built in 1874 on land donated by the Thatcher family. The original 1874 tower bell still rings today. In 1912 this church building was razed and a modified Prairie Style church, designed by William Drummond was erected. The parsonage at 513 Thatcher was built in 1927. In the 50’s, numerous building changes took place, including the redesign of the sanctuary, the addition of a new kitchen, Fellowship Hall and Susanna Wesley Library. From 1964 to 1967 the original 1912 Drummond sanctuary windows were replaced with windows depicting biblical scenes. Beginning in 1867, visiting Methodist preachers gathered people for worship in the Austin Schoolhouse at Lake and Central. Austin Methodist Episcopal Church was incorporated December 1, 1870. With construction delayed for more than a year due to the Chicago Fire, the congregation met in the Town Hall, but the cornerstone for the church at Race and Central was finally laid on July 20, 1872 and the church was dedicated September 7, 1873. The stone church was taken down and a new church, accommodating 1,400 persons, was dedicated June 10, 1900. In 1909 the church burned but was reconstructed. By 1938 the church membership reached 2,500, the largest in Chicago with a Sunday School membership of 1,659. However, urban and population changes resulted in a shrinking membership and in 1973 the congregation made the decision to merge with River Forest. Shortly after the new village of Maywood was formed in 1869, non-denominational services were held in the depot of the Northwestern Train Station. In 1873, The First Methodist Episcopal Church was built on donated land at the corner of 6th and Pine. William Drummond was commissioned and a building in the shape of a Maltese Cross was dedicated in September 1913. In 1954, a much needed building addition was constructed to accommodate the 600 Sunday School members. In the early 70’s, Maywood experienced the same population changes as Austin, and in 1973, during its 100th Anniversary celebration, the congregation joined with Melrose Park to form Covenant United Methodist Church. In 1872, Onward Mission, meeting in a building at Marengo and Franklin, was started in the village of Harlem (Forest Park) to teach the German immigrants settling there. The Chicago German Conference chartered a congregation in 1897, and in 1900, the church name was changed to Forest Park Methodist Chapel. Ground was broken at the corner of Thomas and Adams for the Community Methodist Episcopal Church, later renamed Wesley United Methodist, was dedicated in 1919. The parsonage at 620 Hannah was purchased in 1920. On June 7, 1988, a fire caused by workers replacing the 70 year old roof, destroyed the building. For the next five years, the congregation met in Field Stevenson School. During that time, Wesley entered a two point charge with Covenant United Methodist Church of Melrose Park, sharing a full time pastor. Along with Covenant, the Forest Park congregation merged with River Forest in 1993. As early as 1879, the first Swedish immigrants to this area found work in Oak Park and Forest Park and formed a Methodist Society, meeting in homes until they acquired land at the corner of 14th and Superior. The First Swedish Methodist Episcopal Church, a small white frame building, was dedicated on September 4, 1887. The building was enlarged and restyled in 1892, but on Palm Sunday 1913, the day the mortgage was paid, it was demolished by a tornado. A new brick building was dedicated later that year. Eventually the Swedish conference merged and the church became known as Melrose Park Methodist Church. Most of the church was razed in 1961 to make room for a larger building to accommodate the growing membership. In 1973, with the merger of Maywood, it became Covenant United Methodist Church. From 1985 to 1993, having sold the church and parsonage to Westlake Hospital, the congregation shared the facilities of the reconstructed First Presbyterian Church of Melrose Park and a pastor with Forest Park. In 1993 the congregation found a new home in River Forest. Love to read the history of these five churches! I was trying to find the church that my parents were married in 1946 in Maywood. I needed to find this info to leave on my parent’s Ancestery.com profile. I knew it was a Methodist church but didn’t new the proper name or location other than the town. Thank you so much for the information! The best to you and your congregation. Sincerely, Linda Zeman–Elmhurst, Ill.